As part of our Strings By Mail Sponsored Artist Blog Series, we will be presenting each of our sponsored artists in a casual Q & A format. They discuss the instruments they use, the types of strings they use & why, and any accessories that help with their playing. They also provide any valued advice they may have for musicians in general – or for anyone wishing to pursue a career in music. Q: What kind of guitar(s) do you play? And what do you like in particular about these instruments? A: I have many wonderful guitars, but three primary instruments that I use for performance. The most versatile is my Lowden de Grassi signature model F-35 with a Sitka spruce top and quilted maple back and sides. The custom tailored fingerboard and neck are a perfect fit for my hands making it easy to play, and it’s beautifully balanced from the lowest to highest notes with excellent volume and dynamic range. It’s very responsive, has a fast attack, and it It has a somewhat neutral “color” to the tone allowing me to readily control and vary the timbre. I also play a Jeff Traugott R model with a German spruce top and Brazilian rosewood back and sides. It’s very rich in overtones, giving it a lot of ‘color’, and I particularly like it for slower pieces and music using a variety or articulations like vibrato, harmonics, and pitch modulation. 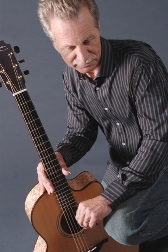 The third guitar is a Fred Carlson 18-string “sympitar” with European spruce top and maple back and sides. The additional 12 sympathetic strings sound when their pitches are played on the regular 6 strings to add a “jawari” sound or buzz much like a sitar or many other East Indian stringed instruments. It is also beautifully balanced, though more of a specialty guitar. The “accompaniment” provided by the sympathetic strings makes it ideal both for delivering rich melodic phrases and for improvising. Q: What types of strings do you use, and why? A: I use Elixir Phosphor Bronze Nanowebs—light gauge on my Lowden and Carlson, and a mixed light/medium set for my Traugott – available at Strings By Mail as a Custom C3 Set. I was not a fan of Elixir’s first generation of strings, but I like the robust, bright but full spectrum sound of these nanowebs, plus they really do last longer than many other strings. That really helps the intonation as I often change tunings during a performance. A: I go every few weeks to the manicurist to have a layer of acrylic on my picking hand nails. I keep them filed short and not to heavy, but the added strength and rigidity really helps for playing steel-string guitar. I also use the A-Frame guitar cradle to hold my guitar in place. This allows me to adjust the guitar at the proper angle and elevation I need and still keep both feet on the ground. That’s good for my posture and helps avoid neck and back problems. It attaches with suction cups on the lower side of the guitar without harm to the finish, and without affecting the sound of the guitar. Q: Do you have any brief advice for musicians in general , or for anyone wishing to pursue a career in music? Browse and shop all Alex De Grassi products at Strings By Mail. Can Amplification Impact Repetitive Motion Issues?